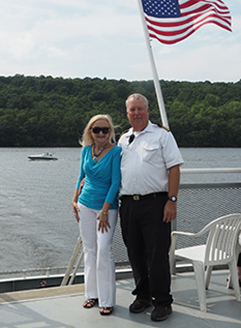 Experiencing a sightseeing cruise with Hudson River Cruises aboard the Rip Van Winkle down the Hudson River exploring the Hudson Valley of New York and the Catskill Mountains was a breathtaking experience. 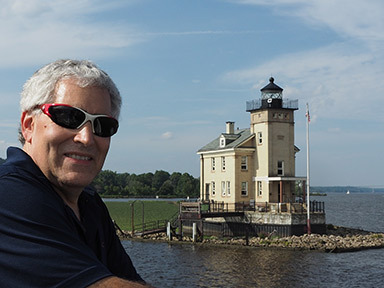 For the past 35 years, Hudson River Cruises has provided stunning vistas and excellent service. The cruises run from mid-May until the end of October, making them the perfect way to experience the beauty during the summer as well during Autumn's annual "leaf peeping." On a glorious blue-sky late summer day on Saturday, August 25, 2018, we took a relaxing 2-hour sightseeing cruise on the Hudson River with Hudson River Cruises based out of Kingston, New York in the heart of the Catskill Mountains. 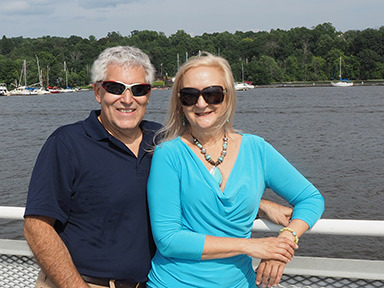 Slathered with sunscreen, we sat on the top deck of the Rip Van Winkle and watched the beautiful scenery of the Catskills and the Hudson Valley unfold around us as we cruised along the Hudson River. 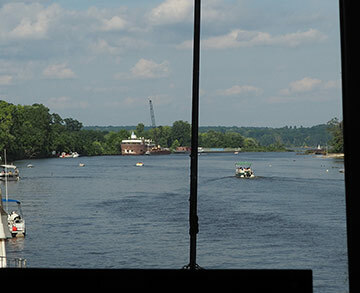 The narrated cruise provided us with insight into the rich history of Kingston, New York and the Catskill Mountains, as well as interesting facts about the impressive Gilded Age mansions that we passed located high on the river banks along the route and information about its former owners. One of the mansions we passed was the Mills Mansion, once owned by Ogden Mills and his wife Ruth, located in Staatsburg, New York. Built in 1895, the 79-room Beaux Arts style mansion was designed by the architectural firm of McKim, Mead, and White, and was used by the Mills mostly to entertain their guests during the Autumn season.The mansion and grounds were donated to the State of New York in 1938 and is now a museum and is known as the Staatburgh State Historic Site. There is something romantic about lighthouses that inspires the imagination about the people that once were keepers of the light, and we had the pleasure of passing two of them during the cruise. 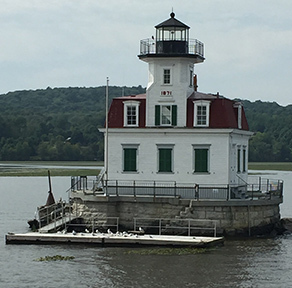 The attractive white and red Esopus Meadows Lighthouse was built in 1871 to warn sailors about the shallow muddy flats. The Roundout Lighthouse is a pretty yellow brick building built in 1915 and is still used as a navigational light. The last keeper who lived at the lighthouse was Mr. Herman Lange (1946 - 1954). It is now owned by the City of Kingston and operated by the Hudson River Maritime Museum. 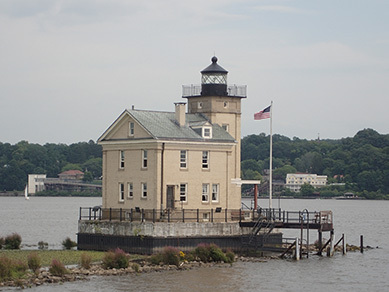 Reached only by boat, the Hudson River Maritime Museum offers select tours of the Roundout Lighthouse each year. The Hudson River, which begins at Lake Tear of the Clouds in the Adirondack Mountains of New York and stretches 315-miles south to New York City to the New York Harbor and eventually flowing into the Atlantic Ocean, has long attracted fisherman, both commercial and leisure, who come to fish the waters in hopes of catching Atlantic Sturgeon or Striped Bass who come to the river to spawn. An interesting fact about the Atlantic Sturgeon is that it is the Hudson River Valley's largest fish and can rangefrom 6 to 8 feet in length and may weight up to 200 pounds. To provide a note of comparison, the largest Atlantic Sturgeon ever caught was up in New Brunswick, Canada with a length of 14 feet and a weight of 800 pounds. 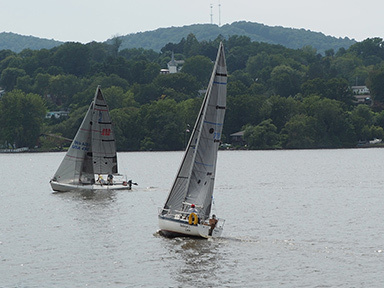 A beautiful sunny day brought out aplethora of boats, sailboats who caught the wind and sailed along gracefully, kayakers, and jet skiers looking for a bit of adventure who playfully raced across the river providing us with endless entertainment watching them. 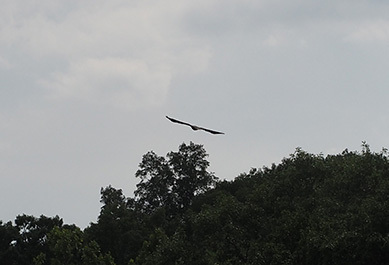 As if to complete a perfect day of cruising with Hudson River Cruises, we had a most memorable sighting of a juvenile bald eagle quickly soar overhead before disappearing into the trees along the Hudson River. As the national bird of the United States of America, seeing the bald eagle was a rare treat and a most wonderous opportunity. Although we experienced a perfect Hudson River Sightseeing Cruise in late August, it must also be spectacular to experience a cruise during the months of September and October when the leaves on the trees will create a showy Autumn display of their breathtaking colors of reds, golds, and oranges. Until next time, keep enjoying the ride! 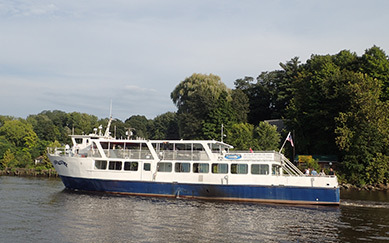 Hudson River Cruises operate sightseeing cruises depart almost daily at 2:30 pm and 5:30 pm. They also have Themes & Music Cruises, July Sunset Sightseeing Cruises, and Happy Hour & Sightseeing Cruises from June until September on Tuesday, Wednesday, and Thursday. Cruises depart at 5:30 pm. They also are available for private events and group tours. 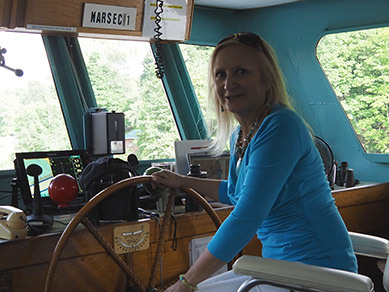 "Your list of top things to do inthe Hudson Valley has to include a sightseeing cruise on the Hudson River!Enjoy clear views of historic Hudson River lighthouses, waterfront mansions,and other notable sites aboard the Rip Van Winkle 2-hour Sightseeing Cruise. Highlighted by our knowledgeable cruise staff, you'll see some of the region'smost unique and fascinating locations on the Hudson River waterfront!" Hudson River Sightseeing Cruise 2018 Pricing: Adults: $27, Seniors (65+): $24, Children (4-11): $19, Infants(Ages 3 and Under): Free. Routes 28, 209 and I-87 (NYSThruway - Exit 19) - Take the traffic circle to Route 587. Follow Route 587 tothe traffic light at the end. Exit 19 off thruway - Take the thruway traffic circle to East I-587. Follow East I- 587 to the traffic lightat Broadway. Follow Broadway to the end. We are located at the bottom of Broadway in the Historic Waterfront Area. Our ticket booth will be on your right under the bridge. Mid-Hudson Bridge - Traveling overthe Mid-Hudson Bridge, take the exit marked 9W North. Continue north on Route 9W for approximately 20 miles. Route 9W (from either north or south) - Follow Route 9W to the City of Kingston. Turn onto Garraghan Drive bythe Rondout Fire Department (from the south this will be on your left and from the north this will be on your right). Turn left at the first traffic light onto Broadway. Kingston-Rhinecliff Bridge - Aftercrossing the bridge, take the first exit. Turn left at the traffic light ontoRoute 32 South. Route 32 (from the north) - turn left onto Route 9W South (Frank Koening Blvd). Turn right at the second traffic light onto Garraghan Drive by the Rondout Fire Department. Turn left at the first traffic light onto Broadway. Route 32 (from the south) - follow Route 32 North into Kingston to Five Corners (there will be a Stewarts on your left). Turn right onto Greenkill Avenue. Make a left turn onto Iwo Jima Ln, make your first Right on Cedar Street. Make your first right on Broadway. Follow Broadway. They are located at the bottom of Broadway in the Historic Waterfront Area. Distance to Kingston from: Albany- 51 miles, Catskill-Rip Van Winkle Bridge - 28 miles, Middletown - 51 miles, NewYork City - 100 miles, Newburgh-Beacon Bridge - 34 miles, Pough - Mid Hudson Bridge - 20 miles, Tappan Zee Bridge - 84 miles, West Point - 49 miles. Read more about the Catskill Mountains in the Destinations, Hotels and Resorts, and Restaurants sections.